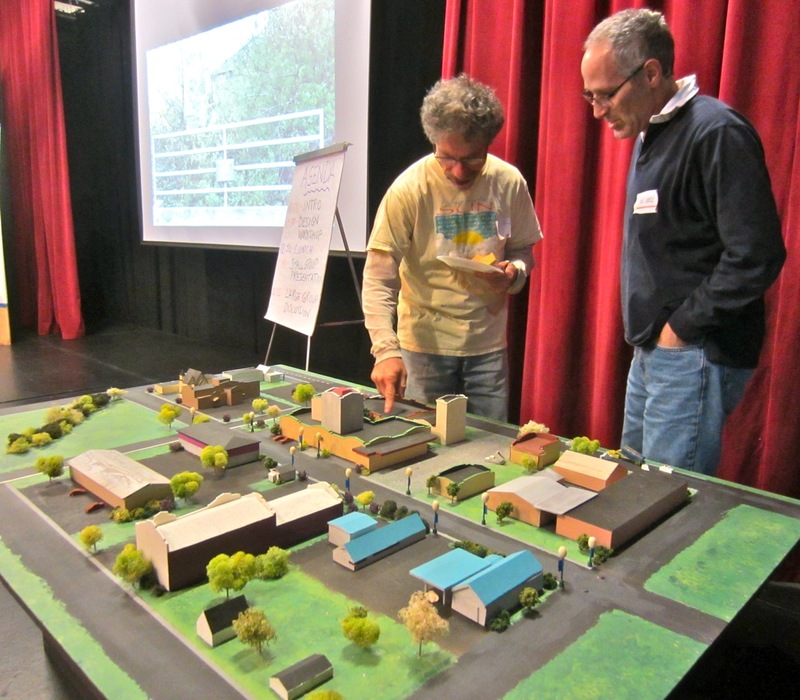 OLD CREAMERY – Creamery District stakeholders gathered again Saturday, Sept. 8 at the Arcata Playhouse to further plot the future of their neighborhood. 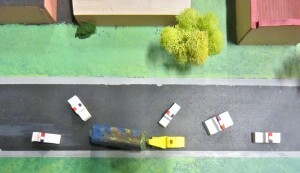 The district model includes a scene typical to the district – a hippie bus being towed away as police stand by. 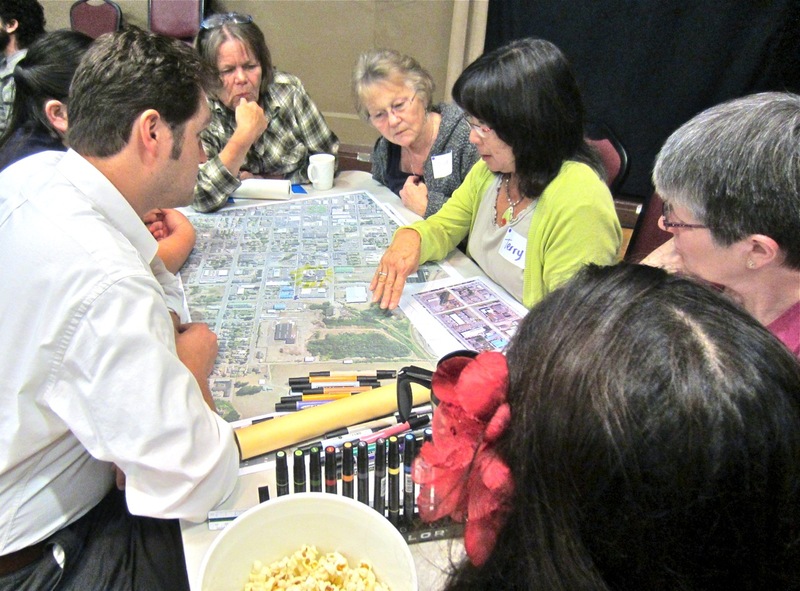 Along with weekly recaps, events have included a community visioning workshop in February, an open house in April, the Solar Eclipse festival in May and an Arts-centered visioning workshop in August. The stated mission of the process is “to enable artists and entrepreneurs to prosper in a vibrant, authentic and diverse community.” Key goals that visioning participants are supposed to iterate with specific proposals are to enable the arts, support creative commerce, create district identity and enhance public space with an underlying ethic of inclusiveness. 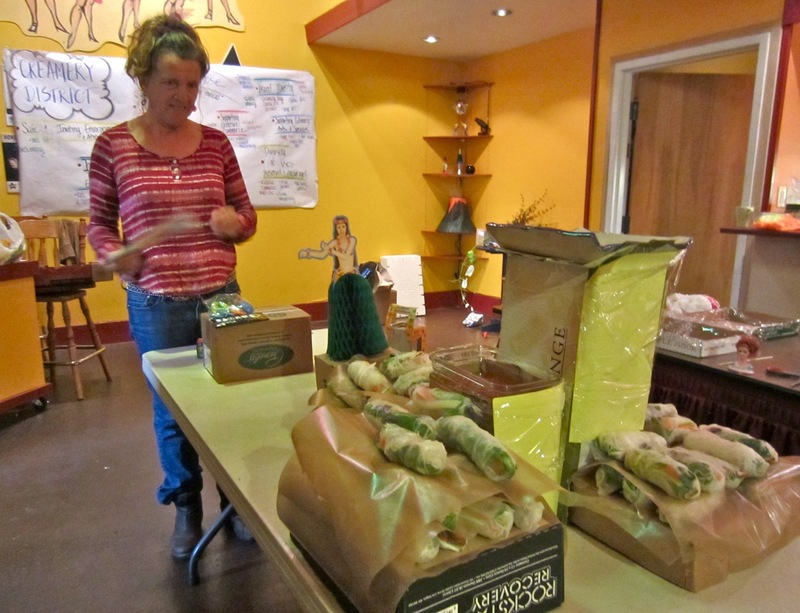 Themes developed in previous gatherings include creating a “whimsical journey through space,” culinary arts, diversity, intergenerational engagement, visual identity, creative commerce, a safe and inviting area with indoor/outdoor features. The district remains largely undefined, and, Scheer said, may always remain so. The district is anchored by the Old Creamery building and extends for blocks around, possibly west to K Street, north to 11th Street and as far south, in some conceptualizations, as Samoa Boulevard. One of the five brainstorming groups. Scheer then broke the 30 or so attendees into five six-person groups, each at a table equipped with maps and pens. The groups were to identify landmarks with opportunities for focus, including “nodes,” or areas with a concentration of activity. The groups busied themselves with maps of the Creamery District, tracing paper and marking pens, putting their ideas to paper. A steady murmur of conversation ensued for two hours as the imagineers pored over their plans. A sumptuous lunch was prepared by City Councilmember Susan Ornelas and friends in the Playhouse’s kitchen. The various dishes – spring rolls, vegetables, cookies and more – were arranged in a rough representation of the Creamery District’s core. City Councilmember Susan Ornelas fashioned lunch items into a rough semblance of the Creamery District. Afterward, the five design groups were asked to name their team, appoint a spokesperson, explain their design focus and the themes they had developed. Ideas ranged from fanciful to practical, some expensive, others cheap and easy. Louis Hoiland represented Team 1, the Cream of the Crop, which focused on the Old Creamery and its immediate surroundings, it being the “Central node” from which the district would expand “like tentacles.” This vision included rerouting traffic away from the front of the Creamery so as to create more space for people rather than cars. More walkways were envisioned, plus increased lighting to make a more “people-friendly” and less scary area at night. More sculpture and plantings would be added for beautification, and archways of various styles and scales would be placed at key locations to beckon visitors to the neighborhood. David Ferney, spokesman for Team 2, the Crazy Bicycle Heads, said his group focused on “in-between spaces,” circulation and accessibility. The group tried to retain open space, including a spot for a circus tent for future festivals. Another idea was to open up and bring out things created in the Creamery. Less parking space would be available out front, with more greenspace and more spots for people to hang out. An art walk would be installed on Ninth Street. Humanity, spontaneity and inclusiveness were guiding themes. Maintaining some continuity between the Creamery’s abundant history and its contemporary, artistic thrust was another goal. A bike rack made of old bicycles was proposed as well. Team Green’s Paul Lubitz proposed that Jolly Giant Creek be daylighted as a water feature, and that a “fire feature” be created for presentation of fire arts in the gravelly area immediately west of the Creamery, where live/work spaces could be installed. The field between the Greenway Building and Tomas Jewelry would be used for outdoor events. An array of sculpture would lead from the Plaza down Ninth Street to indicate a path to an artistic center. Lighting could be provided via illuminated sculpture. Speaking on behalf of Team 4, the Dreamery team, Willoughby Arevalo said his group themed on preservation and history, thinking of the area as a watershed. More live/work and performance spaces were proposed, with improved transportation and access. The creek would be daylighted, more trees installed and bike and pedestrian paths created. An orchard would be planted for urban agriculture. A bridge would be installed over traffic-treacherous K Street. The car wash on K Street and the auto yard on N Street could be turned into live/work spaces. An all-weather outdoor performance space would be created outside the Creamery. Asphalt would be replaced with grasscrete or some similar pervious surface. A “bike tube” would be created to allow all-weather access. Finally, Team 5, Malia Penhall of the Cream Dream Team, said her group looked at a 10-year plan with accessibility and incubation twin themes. The group attempted to create loops in which practitioners of the various disciplines could start small, then graduate to larger-scale enterprises. Ninth Street would be closed off to traffic and made into a sculpture garden. Visual and performing artists would have live/work spaces. A community kitchen and community gardens would enable food carts, the more popular of which would, in turn, become permanent eateries and migrate to the main Creamery area. A covered outdoor performance space would be installed. Rental spaces would be available for conferences and other uses. This group expanded the Creamery District to include the former California Barrel Factory and waste transfer station. Scheer then identified elements common to all the teams. These included gathering spots, sculpture, lighting, greenspace, paths, performance space, parking, creek, defined boundaries, live/work spaces, food, history, destination, repurposing existing structures and spaces, indoor/outdoor continuity and family access. 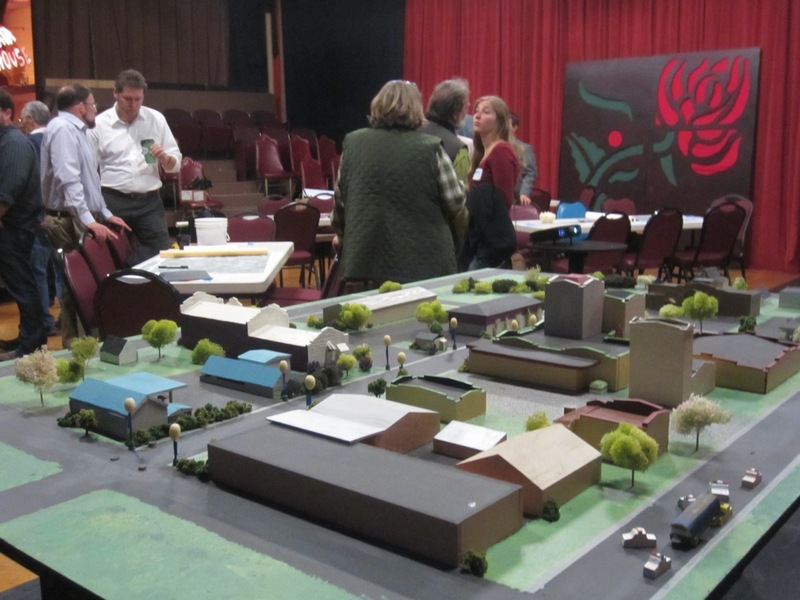 Gaps in the ideation were identified as access, consent of property owners, funding, covered pathways, the former recycling center, City parking requirements and open space. Attendee Patti Stammer said that the area is more family-friendly than the Plaza, noting that the Solar Eclipse festival “wasn’t the drunken Oysterfest.” She called the Creamery District “the red-headed stepchild” of Arcata. Attendee Tad Robinson pointed out that street closures could affect non-artistic businesses in the area, and said that the consent and participation of current property owners would be critical to implementing plans. Scheer acknowledged that many area businesses and property owners aren’t involved in the process yet. She said the purpose of the visioning was to identify small, near-term projects to implement and keep the process moving while demonstrating its intentions and inspiring further progress. Hoiland said that three major and influential property owners – Brian and Lisa Finigan, who own the Creamery; Tom Perrett, owner of Tomas Jewelry; and Paul Lubitz, co-owner of Holly Yashi, were all on board with the process. “Let’s go with the property owners we have,” he said. Attendee Kash Boodjeh suggested that the City be asked what its plans for the L Street corridor be better disclosed. Scheer asked what might be done right away. Branding was suggested in order to invest the area with a sense of place in the larger community. Small local features could be given monikers as micro-landmarks within the district. Signage, lighting, murals and archways were suggested, and a logo might be created. The “cement tower,” once used to store wood chips from the barrel factory, could be (and has been) used as a screen for movies and shadow plays. Stammer freely offered her drab mini-storage lockers for muralization. “Paint away,” she said. Jackie Dandeneau of the Arcata Playhouse suggested dispersed mini-performances throughout the district, using spots as diverse as the storage spaces, Holly Yashi’s picnic tables and even the car wash. This, she said, could redefine the spaces “conceptually and emotionally” in the public’s mind. Next steps are to formalize the district’s oversight/coordinating structure, maintain the momentum the process has developed, to refine the design with public input and to find “low-hanging fruit” and start making changes. This entry was posted on Wednesday, September 19th, 2012 at 9:29 am	and is filed under News, Community, Business, Environment, Media, History. You can follow any responses to this entry through the RSS 2.0 feed.